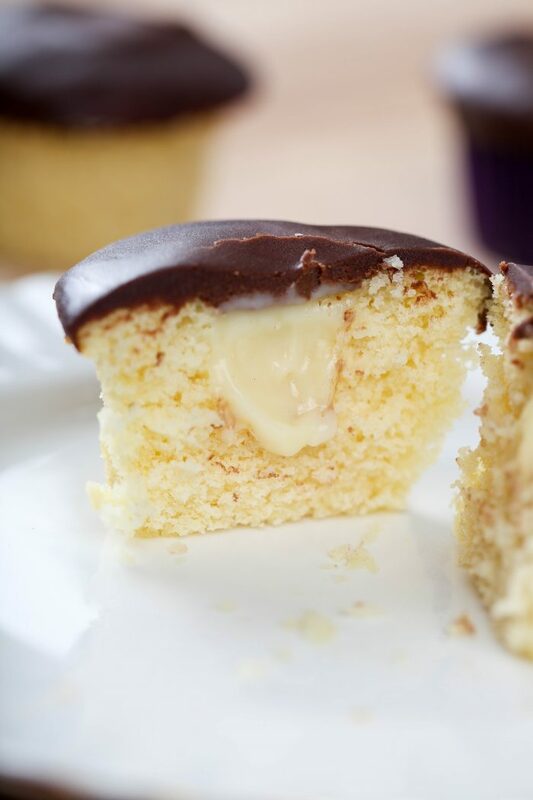 Boston Cream Pie Cupcakes: Tender cupcakes filled with fluffy pastry cream and topped with rich chocolate ganache. Your favorite cake made 10x easier! I love making difficult recipes easier. Cakes are a risky proposition especially if you’re entertaining. If your cake gets stuck, or you drop it on the ground (Been there done that), you are out of luck. Stir in vanilla, eggs, and baking powder. Gradually add flour and buttermilk a little at a time until just combined. Fill prepared liners ¾ of the way full. Bake for 18-23 minutes or until a toothpick inserted in the center comes out clean. In a medium bowl, beat egg yolks. Stir in milk until well combined. In a large saucepan over medium low heat combine sugar, cornstarch, and salt. Gradually whisk in milk. Boil, stirring constantly for 1 minute. Immediately remove from heat. Place sauce pan into an ice bath. Cool slightly and stir in vanilla. When mixture has cooled a bit, stir in vanilla. In a medium sauce pan, bring heavy cream to a simmer. Remove from heat and pour over chocolate chips. Cover for 5 minutes, and then stir until smooth. Core out the center of each cupcake using a cupcake corer or nice. Fill each cupcake with pastry cream. Dip into a generous amount of ganache. Allow to set for 30-60 minutes. 0 Response to "BOSTON CREAM PIE CUPCAKES"